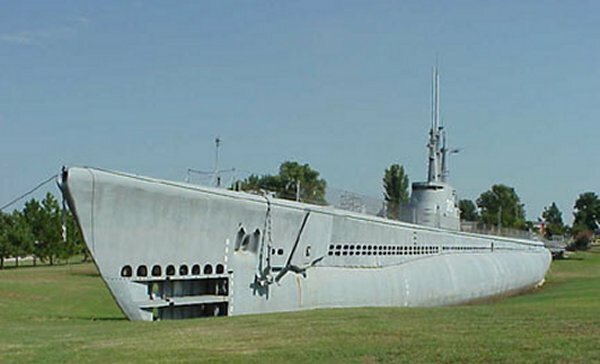 One wouldn’t expect to find a museum ship in Oklahoma, much less an American World War 2 submarine, but the USS Batfish has made its final resting place in Muskogee, Oklahoma just southeast of Tulsa. The Batfish, a Balao class submarine, was commissioned on August 21, 1943 and made 7 war patrols during the course of World War 2. She is officially credited with sinking 6 Japanese ships, however, her ship’s crew claimed 15 ships sunk and such discrepancies are not uncommon. Among those 6 ships were 3 Japanese submarines, granting Batfish entry into the exclusive fraternity of submarines that have sent other submarines to the bottom. The Batfish and her crew earned a Presidential Unit Citation, 10 Bronze Stars, 4 Silver Stars and a Navy Cross for their actions in World War 2. Following World War 2, the Batfish served as a training vessel in the Pacific Fleet and was decommissioned in 1969. In 1973, after much political wrangling by various parties, the Batfish made her final voyage up the Arkansas River to Muskogee where she now continues her service, this time as a museum and memorial to the valiant submariners who perished defending liberty and freedom in World War 2. The ship is open to visitors from March to November.